Been a few weeks since I last blogged, and the kohaku's are starting to push on in their grow on tanks. I've set up auto feeders on both tanks and that's turned things around with the late summer keepers which have taken some time to get on the food in the way I would like. They are still a bit on the small side (3 to 4 inches), but pushing on strongly now and I'm starting to see the different body shapes emerge. There are a good number that have the same type of shape as their mum which is promising. The air source heat pump is coping - even with the tanks uncovered. The pipes, filters etc are wrapped in insulation to keep the heat in. It struggled a bit on the night when air temps dropped to zero - I lost 1 degree in the tanks. So I will need to cover the tanks but for now, I'm holding off. 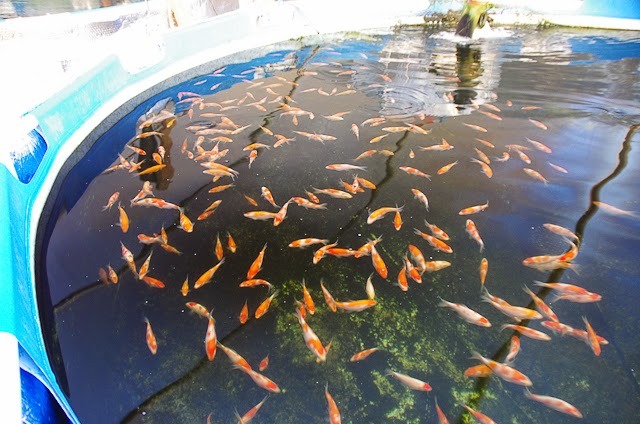 Brood fish tanks are sitting at around 12 degrees and the fish are in good health. With the long lasting summer we enjoyed, the tanks were 20 degrees or above much longer than I expected and I took advantage with the feeding to help them prepare for the winter, and the spawnings next year.